Our Mission: Market and sell Huntington Beach’s Surf City USA brand experience as the preferred quintessential California beach destination leading to increased visitor spending and enhanced quality of life for residents. Funding: Our organization is funded by a private sector Tourism Business Improvement District (T-BID) 4% self-assessment on overnight accommodations that our 23 hotels have agreed to collect to promote tourism in Huntington Beach, and a small amount of private sector funding for specific programs. Event Marketing in Promotion of the Destination: VHB and its board of directors recognizes that special events and festivals can provide vibrant experiences for visitors, showcase the destination to specific niche audiences with special interests, and help drive general brand awareness. 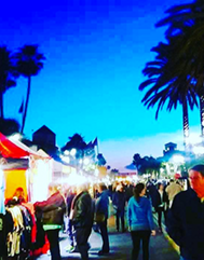 Events can bring in non-Orange County resident overnight and day visitors to the destination, which supports local retailers, restaurants and activity providers. We provide three levels of marketing and service support for events and festivals, as well as three separate tiers of funding support, depending on the event, its target audience, its status as an on-going or developing event, and its visitor-resident mix of customers. Exclusion of Support for Event Operations: VHB is a destination marketing organization. As such, our mission, expertise and support are focused on marketing, public relations, social media, visitor information services and group housing/ bid assistance for events. We do not provide operational support or funds for events. We can make local referrals for assistance with outside contractors for these services. The event will attract non-OC resident day visitors (including estimated quantity) and/or overnight visitors (including estimated quantity) to Huntington Beach, California. The event will have a measurable, numerically quantified positive impact on the local economy, including estimated visitor spending and resident impact. The submitting organization has adequate resources and financial standing to produce the event successfully. The organization is a legally registered for profit or not-for-profit corporation with a legal business license in Huntington Beach, California or within its home municipality. Applicants for funding by existing, ongoing event producers must also provide an audit statement or current financial statements including the last available balance sheet and profit & loss analysis from the most recent fiscal year. Applicants for funding by new event producers need to provide a projected budget, including projected total revenues, expenses and net balance for the proposed fiscal year. Free listing on VHB&apos;s events calendar on our destination website www.SurfCityUSA.com, which receives over one million unique users annually. Free enhanced social media promotions, to be custom developed, such as Facebook Live at the event, digital influencer familiarization trip (FAM) to cover the event, VHB blogger coverage of event, feature in leisure visitor e-newsletter, etc. Other customized support services considered on an individual application basis. VHB is a team of innovative, creative destination marketing professionals. We welcome “off the menu,” custom promotional ideas for major signature events. If you are not applying for funding for your event, please skip to section V.
The number of sponsorships and funding available for event sponsorship by VHB is restricted and may vary from year-to year depending on budgetary limitations. In general, VHB sponsorships shall not be considered as long-term commitments in order to encourage independent viability of events as well as support for new initiatives. An organization can apply for funds for up to five consecutive years; however, there are no guarantees that a sponsorship will be carried over from one year to another. Sponsorships that continue beyond one year should normally expect a 20% decrease in funding each year. An exception may be made if the event organizer can clearly demonstrate through measurable results that the event or activity is substantially increasing its return on VHB’s investment to the City’s tourism community, particularly its accommodations providers that pay TOT/ T-BID funding. Sponsorship may include in-kind services, direct cash payment; or a combination of both. Due to California anti-donation laws, gifts are not permitted. Promote tourism by bringing in overnight guests to our hotels. (See specific minimum requirements within each funding level). Any consideration for sponsorships is predicated on budgetary limitations. Event sponsorship funds are limited. It is essential that prior to making any awards, VHB has the necessary funding to carry out its main mission and objectives. Therefore, the amount set for sponsorships will vary from year-to-year. VHB will accept applications during two pre-determined time periods each fiscal year. Applications will be reviewed by a nine (9) member task force of board members and staff selected by VHB’s chairman and CEO annually, scored by the agreed evaluation criteria, and recommendation for sponsorship funding agreed upon by the task force. The task force chairman will then submit the funding recommendations to the VHB Executive Committee and/or full Board of Directors for final approval and fund distribution. Recipients of Level II and Level III funded sponsorships are required to submit verification of expenses paid for by VHB invested funds to receive their payment disbursement. Any unawarded funds may roll over into the next fiscal year to be used by Visit Huntington Beach as needed for general destination marketing programs. Once the budgetary limits are depleted, no additional requests will be considered until there is a new fiscal year funding cycle. Core Marketing Support Level I applicants will have their information processed immediately and can expect a direct response from staff within five (5) to ten (10) working days. Core Marketing & Visitor Service Support Level II applicants can expect their application processed within ten (10) to twenty (20) working days and expect a request for a phone conference or in-person meeting with VHB staff to align agreement details and information exchange. Core Marketing & Visitor Services Support Level III applicants can expect their application processed within fifteen (15) to thirty (30) working days and expect a request for an in-person meeting with VHB staff to develop a customized support program. Funding applicants will receive a confirmation of receipt of their application via email within ten (10) to twenty (20) working days, along with a schedule for the next round of bi-annual funding sponsorships evaluations by the task force. Applicants for funding greater than $5000 will be called upon to make a formal presentation to the VHB Event Task Force. They may also be asked to present to VHB staff, VHB Executive Committee and/or full VHB Board of Directors. Each group or organization making a request for submission will be required to submit a completed application as well as plans for permitting and marketing. Applicants for funding of $1000 or more are required to submit additional budget or most current financial statements/ audit documents (see tier requirements). The request for sponsorship will be ineligible for funding if any section of the application process is incomplete. Sponsorships at this level will be awarded internally by VHB’s CEO and are not subject to review by the Event Sponsorship Task Force. Special Sponsorship: Occasionally an opportunity comes along to host a major signature event or activity. The cost may be higher than is normally allocated to event sponsorships and the cost benefit far exceeds our normal parameters. These are viewed on a case-by-case basis and a determination is made depending on the overall benefit and its direct impact to the tourism industry, City of Huntington Beach and VHB&apos;s annual program of work or Strategic Plan. In-Kind Marketing Only and Level I funded Events may make submissions starting February 1, 2019 for events occurring on or after March 1, 2019. Level II or III Funding Applicants: Any individual, group or organization wishing to submit a request for Cycle One in FY18-19 sponsorship must complete and submit an application form to Visit Huntington Beach no later than 5:00 PM on September 28, 2018. Insufficient data or an incomplete application will disqualify any applicant. All applicants for this cycle, approved or not approved for funding, shall be notified no later than November 1, 2018, with funding available on or after November 30, 2018.